Pápai Páriz Ferenc, Album amicorum p. 403. 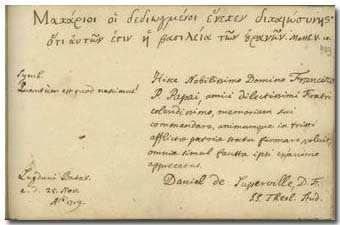 Daniel de Superville, D[anieli] F[ilius] S. S. Theol. Stud. Lugduni Batav[orum] a. d. 25. Nov. A. 1719. * Mt 5:10: Vulgate: “beati qui persecutionem patiuntur propter iustitiam quoniam ipsorum est regnum caelorum”. * This same motto is used by Bernhard Albinus on p. 105. Cf. also the poem written on the same motto by Andreas Gryphius. In Leiden, on November 25, 1719. Daniel de Superville, Jun. was born in Rotterdam on July 11, 1700, the son of the French Reformed theologian Daniel de S. (1657-1728) and of Catharina van Armeyde (1663-1719). He immatriculated in Leiden in the autumn of 1717. He passed his exam as a proponent in 1723, became an assistant pastor on the side of his father in Rotterdam, and in 1725, when this latter retired, he followed him in his office. He was popular amongst his community, and was regarded an eminent preacher. In 1731 he was invited to Amsterdam, but he refused to go. Because of his inclination to illness, and on the counsel of Boerhaave he spent two years at the baths of Spa. He died in Rotterdam, on May 24, 1762. He founded no family. He translated the English history by Burnet and The improvement of the mind of Isaac Watts (La culture de l'esprit, Amsterdam 1762), and for a while he edited, together with Justus van Effen, Willem Jacob ’s Gravesande, Élias de Joncourt and others, the Journal litéraire de la Haye (1713-1737). His sermons were published: Sermons sur divers textes de l’Ecriture Sainte, par Daniel de Superville, le Fils. Amsterdam, 1754. Daniel de Superville, Jun. was a student of theology in Leiden when he wrote his memento in the album of Ferenc Pápai Páriz, Jun. His father, the pastor of Rotterdam wrote his verses in the album eleven days later (p. 365).